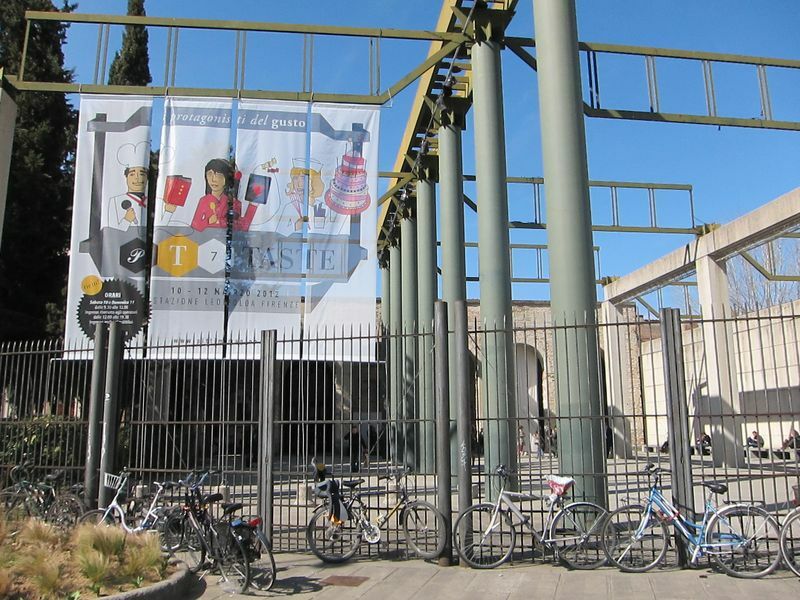 I am a great fan of Taste, the trade food show that is held in Firenze, every year in March. Where else could I meet such a large concentration of Gustiamo‘s producers? In one spot, for three days, we talk about future plans, prices, new products and orders… we have fun, we talk about family things and we share the most delicious gossip, too. Our producers are our friends, we talk on the phone constantly and we love to see them in action at their places, but also at Taste, at least once a year! The big scoop, this year, was that the Martelli family (left), announced they have chosen Gustiamo, Inc. as their only importer, in America! Wow, and thank you!!! 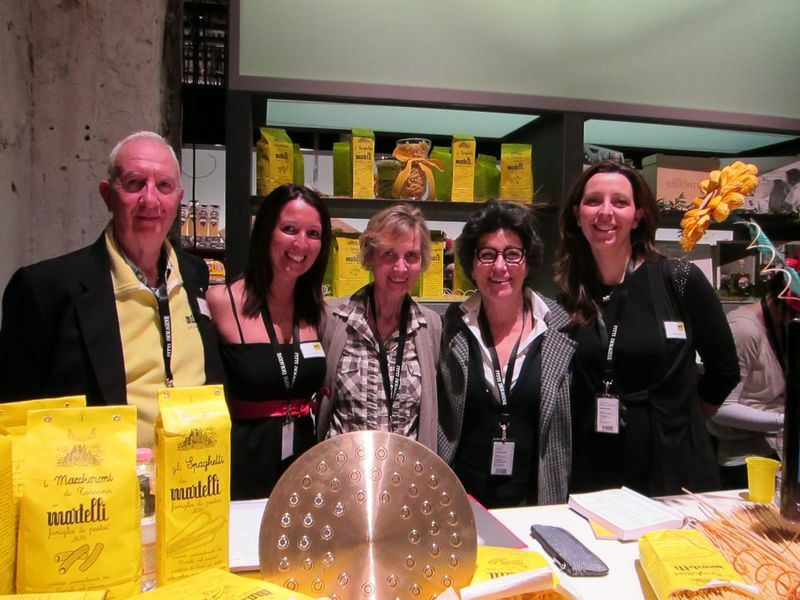 It was great to see Piero Rondolino of Acquerello Rice, the Lunardi brothers of La Molina Chocolate, Antonella Pinna (right) of Antichi Uliveti Extra Virgin Olive Oil, Rosalba Cappelletti of La Valletta farm in Colfiorito, Umbria. In the video below, the Fratepietro family proudly presented the olives from the new harvest, directly from their trees, as Andrea says. Dario Meo, of Casa Barone farm, says: You should taste the Piennolo tomatoes and will not regret it! Try the Piennolo tomatoes on pasta, pizza or, naked, on a piece of bread. Roberto Panizza, aka, the king of pesto, says Ciao America, try my pesto! 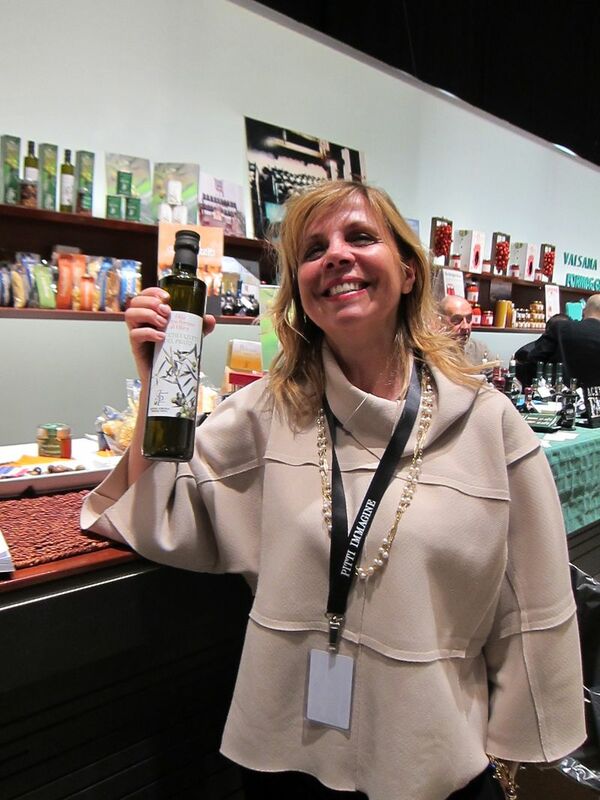 Nicola Bovoli of Vicopisano EV Olive Oil says the oil from the new harvest is wonderful but there is very little of it. Hurry up and place your order, now! Gabriele Lasagni of La Nicchia Capers says: Hi America! happy to be here with Gustiamo! And other than all these wonderful, hard working producers, the Taste show is on a manageable scale in a beautiful spot.